About the Workshop:The topic of money is highly evocative. It can elicit an array of powerful responses – shame, guilt, hate, fear, hope, despair, resentment. Yet, discussions around money remain largely taboo. 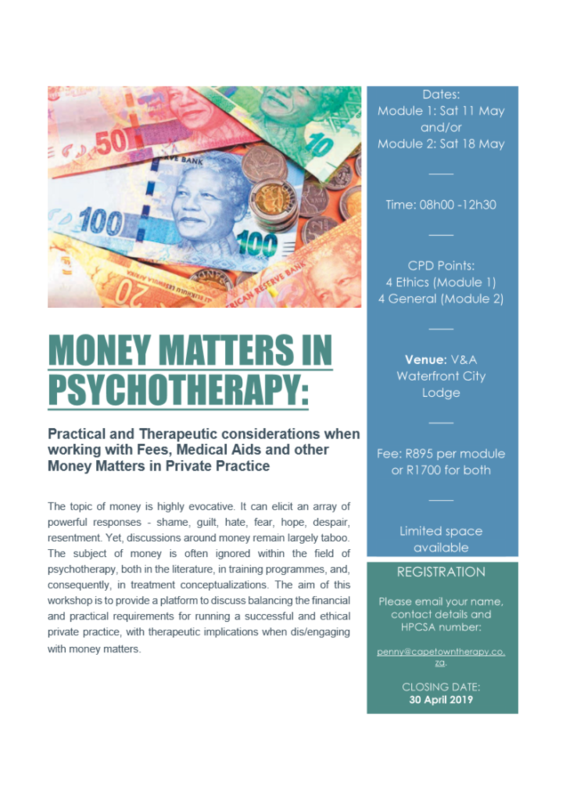 The subject of money is often ignored within the field of psychotherapy, both in the literature, in training programmes, and, consequently, in treatment conceptualizations. 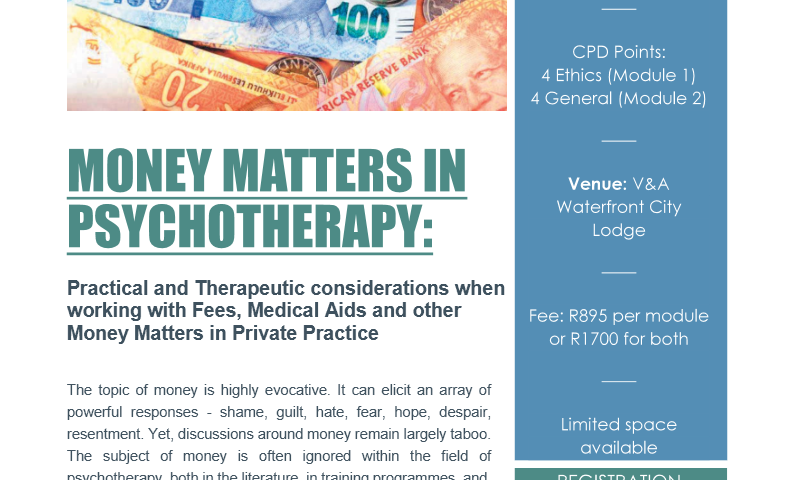 The aim of this workshop is to provide a platform to discuss balancing the financial and practical requirements for running a successful and ethical private practice, with therapeutic implications when dis/engaging with money matters. Money conversations in therapy – What payment practices (setting the fee, cancellations, lowering the fee) reveal about the frame, transference, countertransference and the best interest of the client. Course Material: A course handout containing the presentation slides will be provided at the start of each workshop, which will also include the reference list of course readings. About the Facilitator: Penny Stopforth is a Clinical Psychologist based in Cape Town. After relocating to Cape Town, she joined the Child and Adolescent Forensic Psychiatry Services at Valkenberg Hospital and opened a private practice. She has previously lectured at Rhodes University and has presented lectures at The South African College of Applied Psychology, the University of Cape Town, and most recently, at the 26thInternational Association for Forensic Psychotherapy Conference in Sicily. She has special interest in developing mindful business practices within the context of psychotherapy in private practice.